In deep woods far from civilization, all praise, offerings and beseeching was done. The brief spells and long chants of incantations were over. Now all that was left for the Coven of Three was the waiting. Patiently they looked down upon the Enchanted Circle of Spirit Twine on the forest floor. Patiently they waited as arms outstretched, they Squared the Air above The Circle with their living flesh, in accord with the Written Word. Little itches but none were scratched. Insects, wafting through the air and mistaking the living for inanimate things, landed on their skin, their faces. The Coven of Three ignored them. This final three still standing, winnowed after eight years from a far larger coven, waited for the sign, the something, from this, their greatest most informed most prepared for work of Magiks. They would not be found wanting. This was their ultimate It. 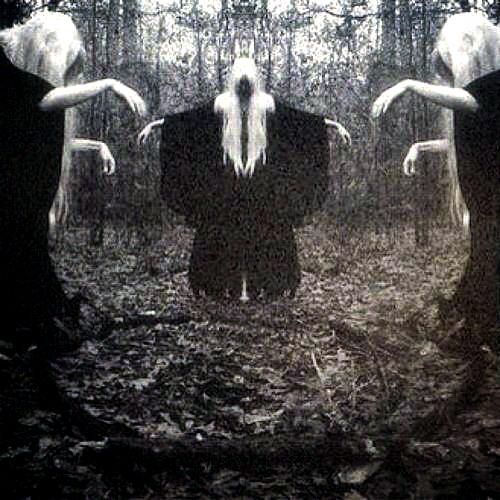 Clouds came and went and vanished from sight, while the Coven of Three gazed down upon the Enchanted Circle of Spirit Twine and waited for the mystical antiphon to their song of enchantments. Muscles ached. This was exhausting and part of that was keeping back the doubt. Stubbornly concentrating against all of the background chatter one’s mind produced. They all had to go to the bathroom, yet they would not. Thirsty and yet they wouldn’t drink. Pangs of hunger hit them all, but they endured. The Eastern star that rose to greet their great work, now settled in the West. The sky was lit by dusk. Witches 2 and 3 disappear over the hill crest. In approaching despair, Witch 1 waits, listening for their return. She hears their motors start and putter away. Witch 1 glares at the Enchanted Circle of Spirit Twine on the ground, laying there like a very long piece of rope she spent many nights weaving and chanting over: It looks very much like the discarded dirty laundry and worthless rags that went into its creation. From the pit of her stomach, the bottom of her heart, the seed of her soul, she screams in a rage of deepest frustration. Art: Unknown. Artist Unknown. If you can prove you are the artist, please contact me and I’ll credit you.